Thanksgiving is right around the corner and it just wouldn’t be right if I didn’t share a cheesy potato dish with you all (like the good Midwesterner I was raised to be). This recipe is adapted from our Everyday Cooking cookbook (! 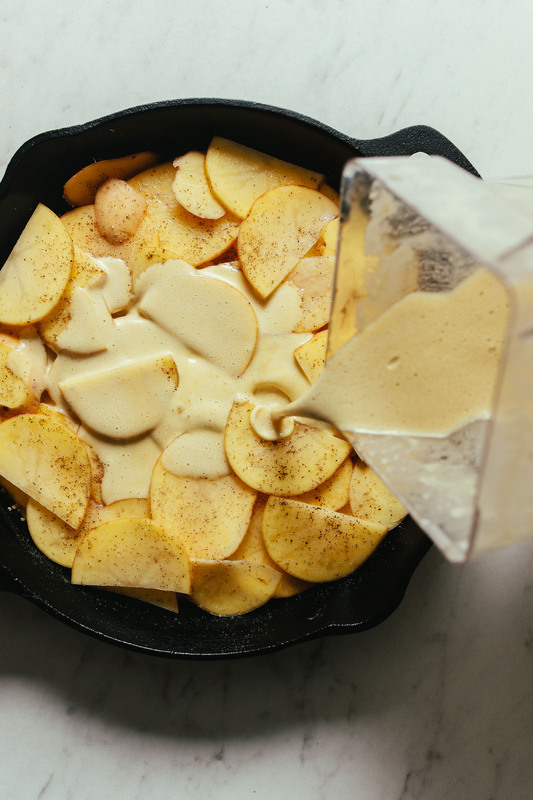 ), is easy to make, and yields a wonderfully creamy, dreamy scalloped potato side dish just in time for the holidays. Shall we? 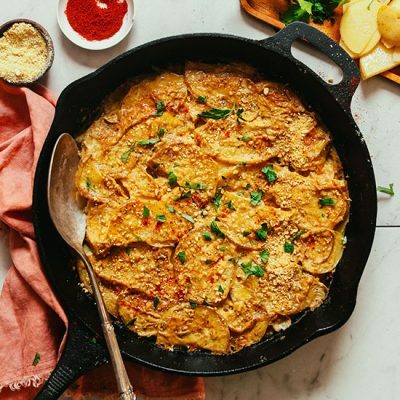 The base of this 10-ingredient dish is a vegan cheese sauce made with sautéed garlic, cornstarch, vegetable broth, almond milk, and nutritional yeast, which covers thinly sliced Yukon gold potatoes before being sprinkled with loads of vegan parmesan cheese. Swoon! I love this dish because it’s easy to assemble, you can do other things while it’s baking (like eat chocolate), and it makes you look like a total boss in the kitchen. People won’t believe there’s no dairy! This would make the perfect addition to your menu for the holidays or side dish to bring to gatherings this winter. It just screams comfort! If you’re into potato dishes, also be sure to check out our Crispy Baked Garlic Matchstick Fries, Oil-Free Cheesy Chili Potato Fries, Simple French-Style Potato Salad, and Vegan Sweet Potato Butternut Squash Tortilla. 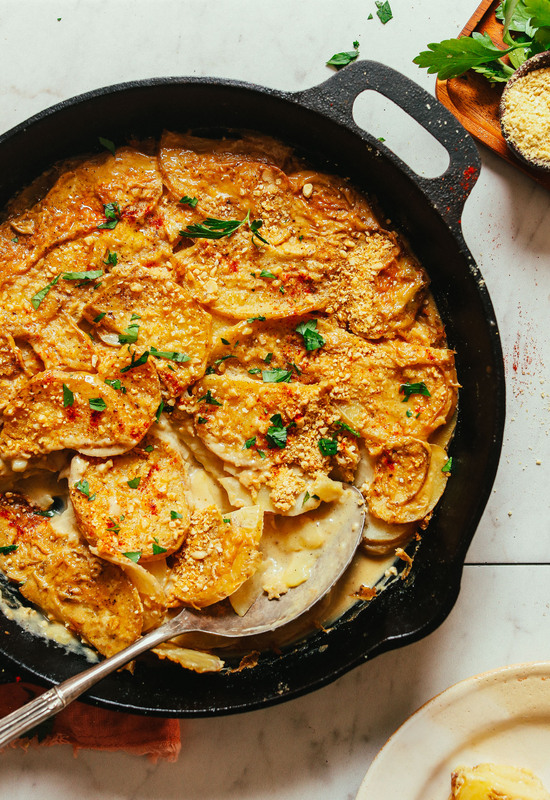 Delicious, cheesy, tender scalloped potatoes made vegan thanks to almond milk and nutritional yeast! Just 10 ingredients required for this classic holiday side dish! Preheat oven to 350 degrees F (176 C). Heat a large rimmed, oven-safe cast-iron (or metal) skillet over medium heat. We used a 10-inch cast-iron and found it to be perfect for this recipe. Once skillet is hot, add olive oil, garlic, salt, and pepper. Sauté for 1-2 minutes, stirring frequently, until just lightly golden brown. Add cornstarch or arrowroot and whisk to incorporate. Cook for 1 minute. Add almond milk a little at a time, whisking to incorporate. Be sure not to flood pan. Whisk and go slowly to prevent clumps from forming. Continue until all of the almond milk has been added. Then add vegetable broth. Whisk to incorporate. Reduce heat to low. Let simmer for 4-5 minutes to thicken, whisking frequently. Turn off heat and remove skillet from burner. Transfer sauce to blender and add nutmeg, a pinch more salt, pepper, and nutritional yeast. Blend on high until creamy and smooth. Taste and adjust seasonings as needed, adding more nutmeg, salt, pepper, or nutritional yeast to taste. Mixture should be very cheesy and savory to season the potatoes well, so don’t be timid. Lightly rinse out skillet (or grab a similar size baking dish) and generously grease with oil or vegan butter all the way up the sides. Lay down half the sliced potatoes and season with salt and pepper. Toss to coat. Then lay flat and sprinkle on 2 Tbsp (10 g) vegan parmesan cheese (amount as original recipe is written // use half of total if altering batch size). Add remaining potatoes, season with a bit more salt and pepper, and loosely toss. 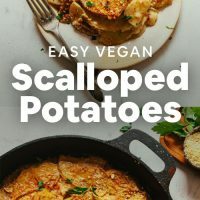 Pour sauce over the potatoes and add remaining 2 Tbsp (10 g) vegan parmesan cheese (amount as original recipe is written // use half of total if altering batch size). Push down with your fingers to submerge the potatoes. The sauce should just cover the potatoes, so remove any potatoes that are well above the surface. Cover with foil and bake on middle rack of oven for 20 minutes. Then remove foil and bake for another 40-45 minutes (a total of 1 hour - 1 hour 5 minutes). Potatoes are done when knife inserted into the potatoes comes out without effort and the top is golden brown and bubbly. Remove from oven and let cool for 10 minutes before serving. As an optional garnish, top with fresh parsley and a dash of paprika for extra color. Store leftovers covered in the refrigerator up to 2-3 days or in the freezer up to 1 month. Reheat in a hot oven and rehydrate with more almond milk as needed. *Nutrition information is a rough estimate calculated with olive oil and with lesser amount of ingredient where a range is indicated. *Recipe heavily adapted from our Everyday Cooking Cookbook! Gave this a trial run before Easter. Wow!!! Yum!!! This dish is so good! Hi! Could I use tapioca instead of cornstarch? Hi Angela, we haven’t tried that, but it might work. If you give it a try, we would love to hear how it goes! Woohoo! Thanks for the lovely review! SO glad you are enjoying our recipes! 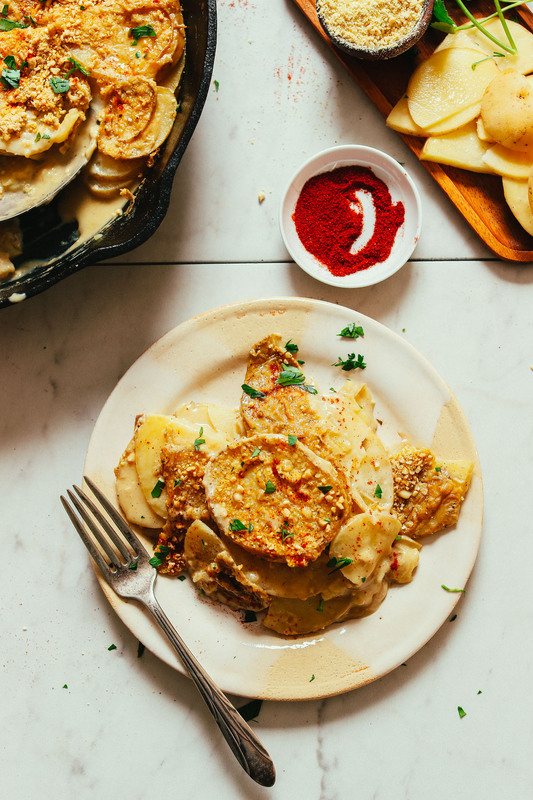 This scalloped potato recipe is an incredible. I fed it to people with no comment about it being vegan. Universally loved. One person said she thought it had cheese for sure. I made this for myself and my 4 year old daughter tonight and it is so so good! I followed the recipe exactly as is and I wouldn’t change a thing. My daughter said it’s the “most awesomest” thing she’s ever had, haha! It really is extremely yummy. I’m usually not one to comment on anything but I just had to say thank you for this delicious recipe! The dish was a total hit! … and everyone wants to see it on the table again. What would suggest it be served with if making a meal for visitors? We’re glad you loved it! It would be delicious served alongside this Vegan Lentil Nut “Meatloaf” or even these Smoky BBQ Black Bean Burgers! I made the recipe and find the taste very nice. BIG question for me was, what quantity of pototes should be added (weight or measureing cup). I find that potatoes can vary greatly in size and was a little lost on how many to add to compliment the sauce. I enoyed the recipe very much. I thickened with white flour – worked well. One question – could you please include the quantity of potatoes added. Potatoes can vary greatly in size, and I did not know what quantity your recipe was based on. Thanks for the suggestion, Carol! I’ll be sure to pass it along! The minimalist baker has done it again! Another delish recipe. I subbed red potatoes and home made cashew, because these are the ingredients I had on hand. I did bake mine in the cast iron. Another request from my hubby to “this is a keeper, it’s delicious”. A nice way to get nutritional yeast in the diet. Thank you Dana! I just made this and holy delicious. I used soy instead of almond milk, and it worked well. I used 1 c of milk instead of 1 1/2 c because I figured that soy is much thicker. The sauce was like this incredible thick gooey cheese that I’m going to make again and use to make grilled cheeses. Hands down best vegan cheese I’ve made at home. However, the dish does look somewhat dark…. but if I’m just going to devour it myself, I guess it doesn’t matter. Just made this and it’s totally divine! I’m not vegan but have been trying to eat less cheese… I’m hooked! I have Celiac and couldn’t find a GF certified nutritional yeast at my supermarket, but it was still delicious without it. Just ordered some from Amazon so I can’t wait to see how amazing it is with the nutritional yeast… Thank you for this recipe! I made this for a holiday potluck and did a test run batch to try out on my husband! Everyone loved it. I did add a bit of cayenne pepper to give it an extra kick. Wonderful recipe! I will definitely make it again! Great! Thanks for sharing, Lena! Made these tonight and they were huge hit – rave reviews (and second and third helpings!) from even the gluten and dairy eaters around the table! Thanks once again for a recipe that will be made again and again! Yay! Thanks for sharing, Lisa! Hi Lisa! While leaving out garlic will affect the flavor, it will still be delicious! Hi Tasch! In your case, I would recommend buying pre-minced garlic which is usually sold in fairy sizeable containers by most grocery stores. You will need ~1 cup of minced garlic but if unsure, begin with a 3/4 cup and work up from there. Good luck! This looks so yummy! Any thoughts on a substitute for the vegan parmesan? One of my family members has a cashew allergy, but I’d love to try out the (modified) recipe for Christmas dinner! Hi Grace! I’ve heard that brazil nuts yield a similar result. So try that first! Otherwise, I would recommend trying a mixture of 2 parts blanched almonds to 1 part hemp seeds. Good luck Elise! So awesome and easy – going into the canon! I made this for Thanksgiving, and my omnivore family all loved it! I did sub in sweet potatoes instead of yukons, and it was a huge hit. Thanks for yet another amazing recipe! I made this for a Friendsgiving tonight and used red potatoes (it was all I had), and subbed soy milk, as well as omitted the nutty Parmesan (as the hostess has a nut allergy). Definitely forgot to sub another vegan cheeze instead. Both the flavor and potato texture turned out very well but the texture of my sauce was really rubbery around the edges of the dish. I blame myself though, I’m not the best cook 😅 overall I liked this dish! Oh yeah, I also doubled the recipe! This recipe was an absolute crowd pleaser. No one believed it was actually vegan. So creamy. It turned out perfectly. The only thing I would do differently next time is doubling the recipe! Thank you! Yay! Thanks for sharing, Melissa! Made this last night – yum!!! I only had soy milk and used some old vegan cheddar from my fridge instead of parmesan, but worked well nevertheless. Thank you! I made this dish for Thanksgiving with my non-vegan daughter. One bite in and she was hooked! I always ask her if what I make should go on the “list” and she loved this so much she asked for it to go to the top. I found it very easy to make and sliced the potatoes by hand. I did cheat a bit (because it was Thanksgiving and I needed the time) and used minced garlic in water that I had purchased. I’m sure using fresh garlic would have elevated this dish even more. 11 out of 10! Dana…you’re our favorite! I made your pumpkin pie as well with a non-gluten free crust and we loved that too. Hi! I am excited to have this for dinner tonight and am psyched to pair this with a Brussels sprout salad. My prep time was about 35-40 min and the dish is currently in the oven. I got my ingredients ready ahead of time, but for some reason it took that long to get it all together. I used a mandolin to slice the potatoes. Can i sub the vegan parm with a different kind of vegan cheese? If so, any idea which would work best? So delicious! Thank you so much for amazing ideas! Yay! We are so glad you love this recipe! I made this for dinner tonight and it was incredibly delicious! It’s crazy that it’s possible to make something like that without any dairy. The flavor was so rich. My only problem is that it turned out looking kind of grayish/brown on top…not super appetizing looking haha so I’m worry that if I make it for non-vegans, they won’t give it a chance. Do you have any idea why it might have turned out that way/how I could make it turn out better next time? Hi Bethany! We are so glad you enjoyed the recipe. As for the color You were seeing, it will vary depending on the color of your potatoes and the amount of nutritional yeast used. The more nutritional yeast, the more yellow in appearance. Hope this helps! Wow this looks AMAZING. I want to make it for my family’s Christmas. If I doubled the recipe, do you think it’d fit relatively well in a 9×13 pan? I am wondering the same thing, I need to make a dish that can serve 30 people. Will this cook thoroughly if I make a large batch and cook it in two 9×13 casserole dishes? Yes, that should work! We hope you love the recipe. Happy Thanksgiving! I am on a low potassium diet and cannot have potatoes unless they are sliced thinly and then double boiled. They are not tasty!! I think if I sliced them thin, soaked them for 4-6 hrs in warm water, then changed the water and repeated a soak again, then rinsed with cold water and used this recipe, the potassium content would be greatly reduced. Your opinion would be appreciated. It could be a sleeping kidney recipe?? Could I substitute soy milk for almond milk? 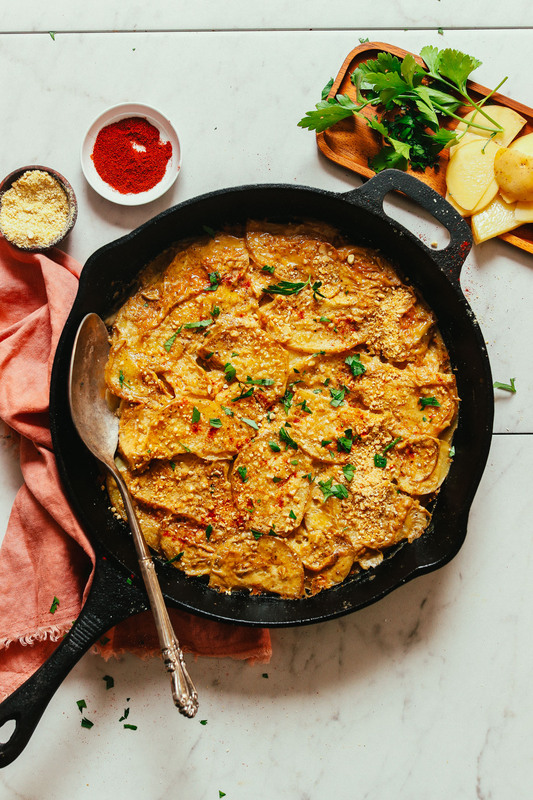 This looks wonderful and I can’t wait to make it….however…what is a “medium” potato???? It would be so helpful to include the approximate weight you are suggesting. I run into this problem all the time. But thank you for all your wonderful recipes. Do i need the nutritional yeast? 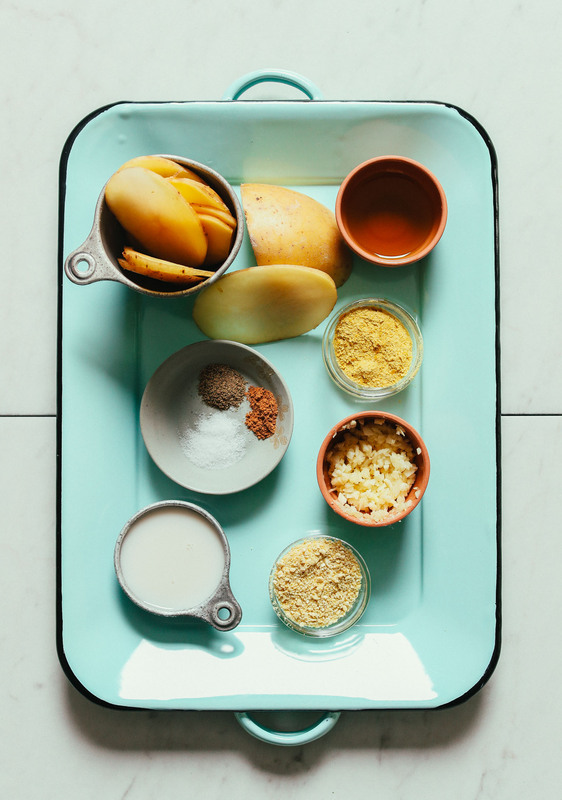 While you don’t need nutritional yeast, it definitely adds to the overall flavor of the recipe so I would recommend it! looks delicious! Ill do it. Thank you for he recipe. Yum, I can’t wait to make this. Probably tomorrow night, yum yum!! I use a sharp knife. I do have a slicer attachment on my food processor but then I have to wash it all up! One sharp knife vs a whole food processor… and I am the dishwasher :).